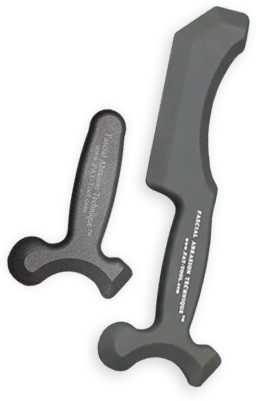 The Fascial Abrasion Technique (FAT) Tool is specially designed for health care providers. Our patented textured finish helps to decrease tissue sensitivity while allowing for a better grip of the surface tissue. Unlike most tools, it leaves no bruising and virtually no skin irritation. Less than half the size of the FAT Tool, the FAT Tool Mini features the same unique textured surface as all of our FAT-Tools and has 5 different treatment edges. It is ideal as an extra tool for your set, for clinics with multiple rooms or the provider on the go. A specially designed FAT-Tool model for personal trainers and strength coaches is available to assist in mobilizing tight fascia and help improve motor function. A special FAT-Tool workshop ensures that you will be able to develop skills and confidence in effective use of the tool with your clients. Great for athletes and non-athletes alike!